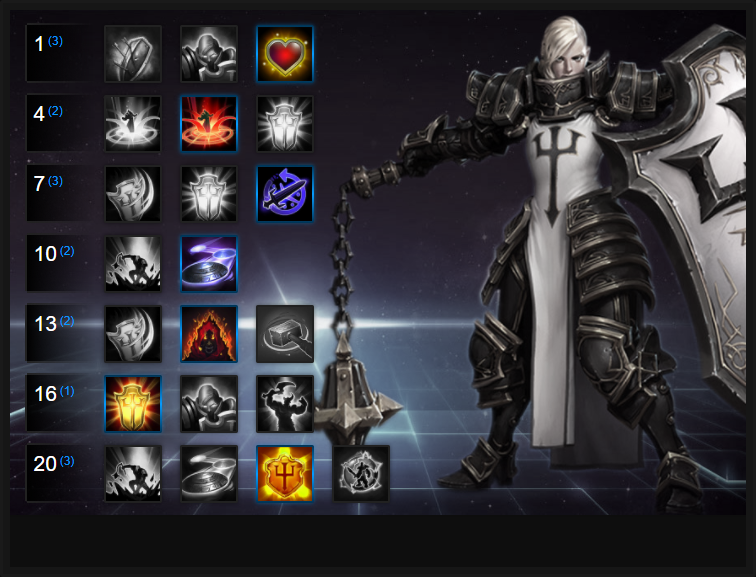 In this Johanna Build Guide, we provide an overview of her strengths, abilities, talents and matchups. Johanna is probably the most rounded warriors in Heroes of the Storm. Unlike Muradin, Sonya or even Anub'arak, she has amazing survivability and crowd control but sacrifices mobility for it. With the ability to stun, pull and slow enemy targets, she's formidable at pushing the enemy team back and if you're fighting them, keeping them in place for you and your team to deal. Unlike Muradin or Anub'arak, and as mentioned above, she has almost no mobility. Her lack of leaps or speed make her somewhat vulnerable to being snared or rooted. Fortunately, her trait allows her to shield herself and become Unstoppable. Although the trait will save your life (often!) you still have to be very aware of your surroundings as a single root after Iron Skin has been used can see you burnt down quickly. To be truly effective with Johanna, you have to be unafraid to push. Your use of Condemn combined with Punish can make most people panic and if you have Iron Skin ready, you can gaurentee you've got the ability to escape if your engage goes badly. Although you're tough, it also doesn't mean you should be suicidal. If your numbers are equal, it's usually more than fine to push in. Can't position enemies like Diablo or E.T.C. can. Iron Skin (Trait) - Ironskin is an incredibly powerful Trait that allows Johanna to become unstoppable, gain shielding and absorb damage for 4 seconds. The shielding scales well and because you're unstoppable, you can break free from everything. The beauty of Iron Skin is the fact it not only allows you to survive for a considerable amount of time, but it can also guarantee your escape when a fight has turned south. During early game, you can also use it to soak ammo from the enemy teams towers (at least 3 to 4 shots) before you have to retreat. Try to use Iron Skin only when you need it as its cooldown is lengthy. Punish (Q) - At 40 mana Punish is a cheap to cast, deals good damage from level 1 snares by 25%. Although its range is very short (practically point blank range) it's a good ability for early bullying of your lane. Its radius is fairly wide so it's a valuable tool for clearing minion waves or harrassing an enemy Hero. If you can, try to really get as close as possible to minions and Heroes so that you land Punish but then automatically hit a basic attack. It allows for a fairly good spike. Condemn (W) - Providing Johanna with an invaluable pull, a brief stun and dealing minor damage, Condemn is incredibly for not only clearing minions but for also gathering together the enemy team or preventing a group of them from escaping. The brief stun also allows Johanna to interrupt channeled spells or Ultimate abilities such as E.T.C's Mosh Pit. Just be sure to only use it when you know you can pull someone, otherwise it's a lengthy cooldown for nothing. Shield Glare (E) - One of my favourite skills in the game, Shield Glare is invaluable. Dealing minor damage, its strength is in its blind. Preventing basic attacks for 1.5 seconds, it can not only save your life but your team mates as well. The fact it has a long range and wide cone mean it's also pretty hard to miss with it. At later levels Shield Glare can heal Johanna and increase damage against those blinded by it. As a tip, Shield Glare is incredible for revealing Zeratul and Nova. If you've a keen eye (which takes practice!) you can easily spot their shimmer and fire it off in their direction. Blessed Shield (Heroic) - I would argue that Blessed Shield is Johanna's best Heoric as it allows you to deal damage to several targets but also stun them in the process. Although the stun only lasts for 1 second per target, it's enough to disrupt most ability casts and importantly, enemy Heorics. Malfurion, ETC or Li Li are particularly good targets with Blessed Shield as it will disrupt all their casts. Try to save Blessed Shield for these moments or when players are trying to escape. For pure sustain, take Laws of Hope. It's a great talent as it provides a significant amount of health when activited (30% of your maximum health over 4 seconds). It's particularly good if you have Brightwing or just Tyrande on your team. Even if you have a full healer, it gives a little more breathing room to dive in and out of combat. Johanna has pretty terrible mobility, so gaining 25% movement speed while Condemn is charging, thanks to Conviction, allows her to chase with ease. No can can escape her, and when she does get near, she's in a solid position to pull them again. Blessed Shield provides a ranged stun that can affect 2 nearby enemies. It's invaluable for preventing players from escaping or interrupting a group of opposition so that you and your team can deal maximum damage. Against any Heroes who have channelled Heorics, it's a must for interrupting them. Johanna is regularly in the thick of things and so the additional AOE damage from Holy Fury adds much needed pressure against the enemy team. The damage isn't enormous, but does add up if you can land your Condemn against them (+40% bonus for 5 seconds). Building on Johanna's need for sustain, Holy Renewal allows her to heal herself every time she hits an enemy with Shield Glare. If she can tag multiple enemies at once, it's an instant (and significant) amount of healing that will keep her alive for that little bit longer. As the front-line Tank, you will die. It's inevitable at times so Indestructable can be invaluable. Granting you a shield upon death, it will save your life and buy you time to be healed up or escape. Variable: If you aren't dying but your team is struggling to survive as a whole, Storm Shield is valuable. The AOE shielding is significant and is great for reducing incoming damage at the start of a team fight. These Hero Threat Levels (1 being lowest threat and 10 being highest threat) are to help you determine which enemy Heroes can give you a headache. Any Heroes that aren't on this list are easy pickings for Johanna. If a Hero is listed here, take greater care. Jaina: She's a threat because of her ability to slow you and as a result, you'll struggle to escape. Although you can use your Trait to flee, you're then highly vulnerable. Kerrigan: Her shielding, stun, leap and pull makes life very difficult for Johanna. You want to escape but she'll try to keep you pinned as long as possible. Try to dodge her pull and save your Heoric. Lunara: Her damage over time, mobility and range make her a headache. The best you can hope for is to land your stun or retreat. Thrall: Self healing, a powerful stun Heoric and a root make life for Johanna pretty miserable. If he does root you, you can use your Trait to escape but he'll follow up with some big damage at the very least. Valla: Her auto attack damage is huge and she can punish you fairly heavily if she's left to her own devices. This list of tips and tricks are just a handful of things we think will help your Johanna play. We'll continue to add to the list as required and if you have any tips you'd like to share, let us know in the comments below and we'll place them here. 1. It’s not worth using your Trait just to become Unstoppable, unless you’re going to die if you stay where you are. If you’ve plenty of health, just save it for when you’re really in trouble. 2. Remember that your Trait provides you with a huge amount of shielding. You can afford to be aggressive with it, if your team aren’t retreating. 3. Punish is a slow first and foremost. Use it against as many players as possible to limit their mobility. 4. Try to land Punish on a high value target, or an enemies front-line Hero so that they’re slowed. It’s a good form of peel for your team. 5. Don’t use Condemn when running away from players - it will pull them closer to you. 6. Remember Condemn is a pull and stun. Use it to interrupt key abilities. 7. Try to always position yourself so that Condemn grabs as many enemy Heroes as possible. It means you going deep into the enemy team, but it's worth it. 8. Shield Glare should only ever be used against Heroes when they’re about to attack. Don’t just randomly use it. 9. Use Blessed Shield only when you can interrupt an ability or to kill a Hero. There’s no use randomly stunning in the hopes something will happen. Most Heroes can survive early use of it. 10. Against Heroes such as Sgt. Hammer, Lt. Morales, Jaina or Chromie, Falling Sword can be an amazing way of reaching them.